Frequently asked questions will be posted here. Q. Do I have to buy my own uniform? If so, does it cost a lot? A. No, the uniform is loaned free but you have to look after it and give it back when you need to exchange an item or when you leave. You will need to provide a pair of black shoes and boots for certain activities. Q. How often do you get to go flying? A. We aim to get you in the air at least once a year but as some cadets focus on other activities sometimes you might fly much more frequently. Q. How much does it cost? A. It costs about £12 a month to belong to the ATC in Guernsey which is great value for money (less than a TV licence!) considering what you get out of it. However, should this sound too expensive, please talk to us as we have a great support and fundraising Committee your parents could get involved with instead. Other activities such as camps or expeditions could be £40 upwards but again is great value for money. Q. How old must I be to join? A. You can join when you’re 13 and usually leave when you’re 20. The latest age you can be to join is 17. Q. 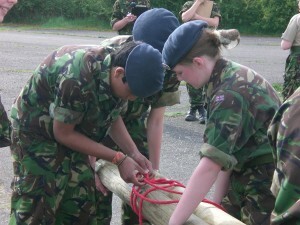 Can I join the Air Cadets if I dont want to join the RAF/military? Yes. While some cadets do choose to join the military, the training provided by the Air Cadets is held in high regard by civilian employers too and there is no pressure on cadets whatsoever to consider a Service career. Clearly if you do want to join the RAF the Air Cadets will give you a sound understanding of the organisation.